Goes Anywhere To Create RGB LED Color Washes – No Cords Required! Now entertainers and designers can do “loads” of wash on the fly, thanks to the new WiFLY Wash Bar from ADJ. A battery-powered linear RGB LED fixture with wireless DMX capabilities, this compact, portable unit is ideal for creating massive washes of saturated color on walls and stages, without having to worry about the restrictions imposed by power cords or DMX cables. The no-strings-attached WiFLY Wash Bar is the newest product in ADJ’s innovative WiFLY Series of battery-powered lighting fixtures featuring wireless DMX control. It’s designed to work with ADJ’s WiFLY Transceiver (sold separately), an easy-to-use wireless DMX transmitter/receiver that can control compatible WiFLY fixtures from distances of up to 400 feet. The WiFLY Wash Bar gives you the tools you need to unleash your creativity. It is equipped with 15 ultra-bright 1-Watt LEDs (5 red, 5 green and 5 blue) that use variable RGB color-mixing to create a seemingly endless palette of rich hues. 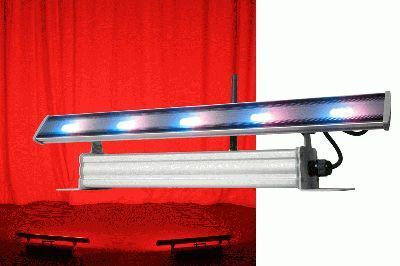 Its huge 120° beam angle makes it great for stage/wall washing or covering large areas with lounge-type background lighting. You get plenty of professional features too, including 0–100% dimming, 35 built-in color macros, an LED pulse and strobe effect, and flicker-free operation. In addition to controlling the WiFLY Wash Bar in DMX Mode via ADJ’s WiFLY Transceiver or WiFLY RGBW8C, DJs and mobile entertainers can let the unit run through its own built-in macros and color fades in Show Mode, or operate it Manual Mode using RGB dimmer controls. DMX addressing may be changed by using the 4-button LED menu located on the back of the unit. The unit is also incredibly energy-efficient. Its long-life, cool-running LEDs are rated at 50,000 hours, with a maximum power draw of 18 Watts. Adding to its convenience, the WiFLY Wash Bar operates in either multi-voltage AC (AC 100–240V, 50/60Hz) or DC (DC 12V) power, which really comes in handy when it’s time to recharge. Its battery requires 2.5 hours of charge time. Compact and highly portable, the WiFLY Wash Bar measures 20.25"L x 3.25"W x 4.25"H (513 x 78 x 107mm) and weighs only 5 lbs. (2.2kg). It includes brackets for easy wall-mounting, or it can be set on the ground for a colorful wash of dramatic uplighting. The suggested retail price of the WiFLY Wash Bar is $559.95.